The ONLY place where you'll find all the possible answers for 94%, for all the levels. 94% (Percent) is the most popular trivia game right now, and it was made by SCIMOB. It is fun to play because in each level you get 2 topics/questions and one picture and you have to find multiple answers related to the topics and pictures. Unfortunately the levels are randomized on each device and the only way I can help you solve all the levels is by providing a list with all the questions and photos. You will have to manually find your level (use Ctrl+F to find your level faster), but at least i made the list in alphabetical order so this will help you a little. On each update 94% gets some of the questions are changed a little, and some of the answers will not correspond, I will revise the list on each update so be patience. 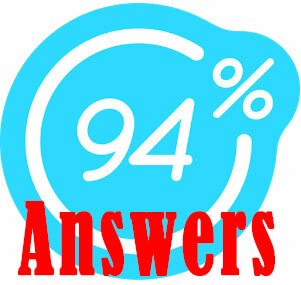 94% Answers, Cheats, Solution for Android, iPhone, iPad, iPod.